Welcome to Palestine, within the dusty and permanently restless Roman province of Judea. 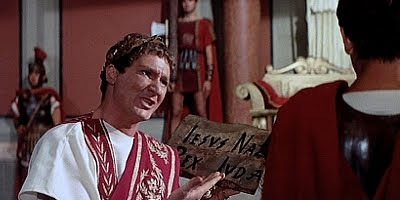 Pontius Pilate, newly appointed governor has been given the exacting task of providing Roman law and order and after defiling the sacred temple, Pilate, to placate the masses, begins the construction of a mighty aqueduct. However when the aqueduct passes over a sacred burial ground further violence ensues and added to this is the famous trial of a "blasphemer" leads to the complete failure of Pilate as Governor. He is ordered back to Rome in humiliation and defeat to forego his own trial. Starring Jean Marais, Basil Rathbone, Jeanne Crain and John Drew Barrymore in the roles of both Judas and Christ, this Italian Peplum is a very sympathetic view of the man Pontius Pilate and of the events that led to the crucifixion. The sets, costumes and period detail are nothing short of spectacular. This is a lavish and extremely epic film. Not to be missed by fans of Italian Sword and Sandal.